Words, Photos, &amp; Video by Teddy Knape My roommates were asking me why I would spend twelve hours stuck in the back seat of a small car just to watch ski movies, doesn’t quite sound worth it. I was trying to explain that The Freshtival is far more than a few ski movies premiers, it has established itself as undoubtedly the largest pre ski season kick off event. Now three days long, the Freshtival combines 9 ski movies premieres, countless parties, and a wall ride competition put on by Red Bull that features big name pros battling against top local skiers. The event draws a large crowd from Calgary, surrounding areas, as well as some big names in the industry. The top pros, filmmakers, and other industry players present are too many to name. An excited fan after getting a few autographs.Day one of the Freshtival kicked off on Thursday, with movie premieres of Rage Film’s “Booter Crunk” and Teton Gravity Research’s “Tangerine Dream.” These premieres were our first chance to see the new venue for the Freshtival. 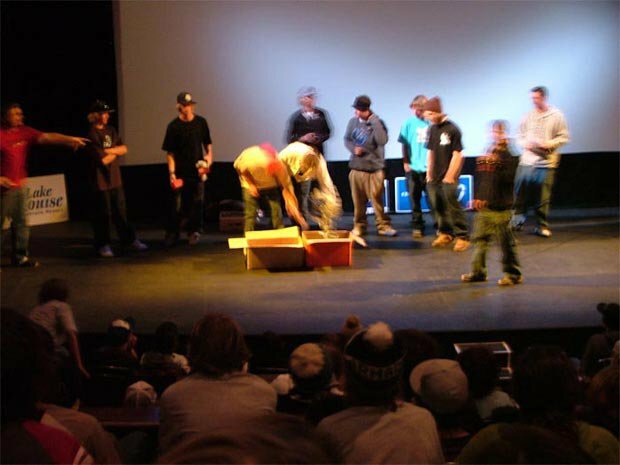 In previous years the premieres were held in a lecture hall on the S.A.I.T. (South Alberta Institute of Technology) Campus. This year due to increased demand the premiers were moved to an actual theatre in downtown Calgary. These first two shows were presented by The North Face so prior to the movies North Face Athlete’s Dana Flahr and Ingrid Backstrom signed posters for fans. One of the tamest after parties I’ve been to was held after these movies. The general consensus was most people were saving their energy for the following nights. The second day of the Freshtival featured 5 different ski movies. The After School Special presented by Orage featured Plehouse’s “White Shine,” Theory 3’s “Safety Meeting” and Level 1’s “Shanghai Six.” Orage athletes JP Auclair, and TJ Schiller, as well as Josh Bibby were on hand before the movies to sign autographs for the many excited fans. Following the first three movies was a one hour intermission, giving a nice chance to stretch your legs and get even more posters signed from athletes Tanner Hall and Simon Dumont who had showed up sometime during the first three movies. The final two movies, Kris Ostness’s movie “Teddybear Crisis as wells as Matchstick Production’s “Hit List” had to be moved to a larger theatre to accommodate the large audience. Despite this the theatre was still completely full, forcing a standing room only situation. The skiers from “Safety Meeting” throw schwag to an excited crowd After the first two days of the Freshtival it was hard to believe the biggest day was yet to come. The third and final day of featured the Poorboyz Production “WAR,” and The Bigger Picture’s “Pop Yer Bottlez.” Following these movies a huge Wall Ride competition put on by Red Bull was setup to take place. However, before the movies could start, all the skiers in attendance had to get posters signed. Tanner Hall, JP Auclair, TJ Schiller, Anthony Boronoski, Seth Morrison were all present to sign autographs for the fans. “Pop Yer Bottlez” played first, but not before a brief introduction to the film by Tanner Hall. Again both movies were seen by a completely sold out crowd. 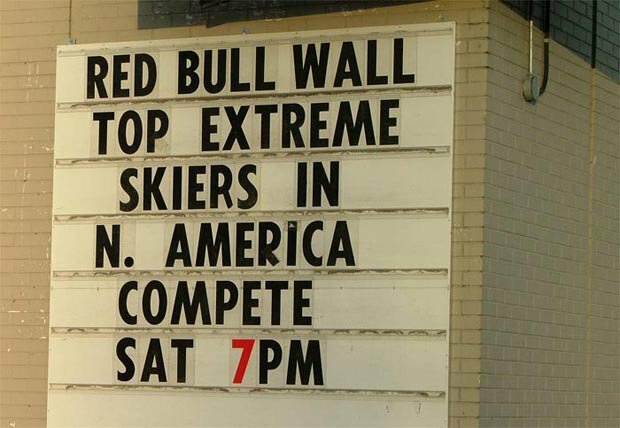 Following the premieres the crowd of people headed over to the Roadhouse to watch the biggest even of the weekend, the Red Bull wall ride competition. 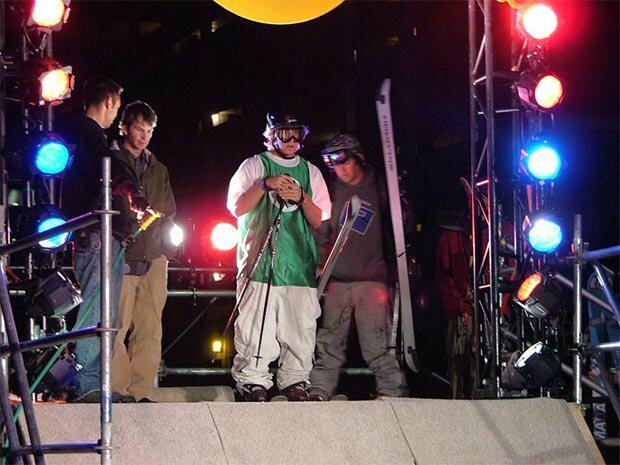 Quite different than the rail jams of previous years, this year the competition would take place on a wall ride in downtown Calgary. 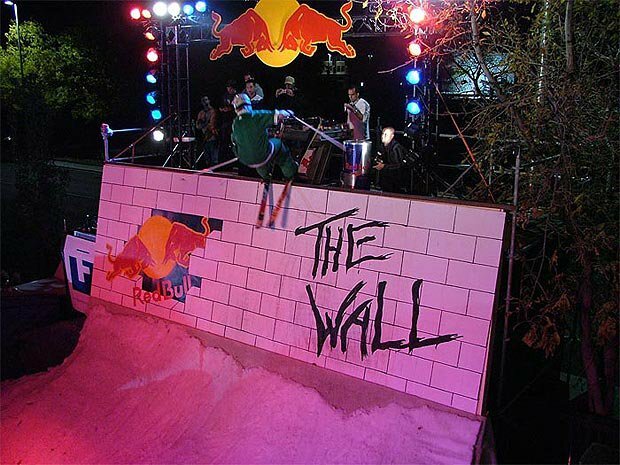 The setup had athletes starting from a scaffolding ramp placed on top of the Roadhouse Bar, dropping in off the ramp and skiing into a 15ft high, 30ft long wall ride. Athletes sessioned the wall ride for nearly an hour getting a feel for the wall as people showed up. TJ SchillerAfter the long practice the field was split into two heats, each heat would have a half hour jam session with the top 2 skiers advancing to the finals. The first heat featured skiers such as TJ Schiller, Justin Dorey, Riley Leboe, Philou Poirier and Matt Hayward. TJ and Riley threw the most technical tricks, commonly spinning a 360 off the top of the wall. Hayward and Philou took a different approach than the other competitors. Philou was consistently hand planting on the top of the wall; Hayward just used the wall as a ¼ pipe to cork 540s. The second heat was nearly as stacked with good skiers as the first; Simon Dumont, Mike Riddle, Josh Bibby, and Myles Rickets were some of the competitors. 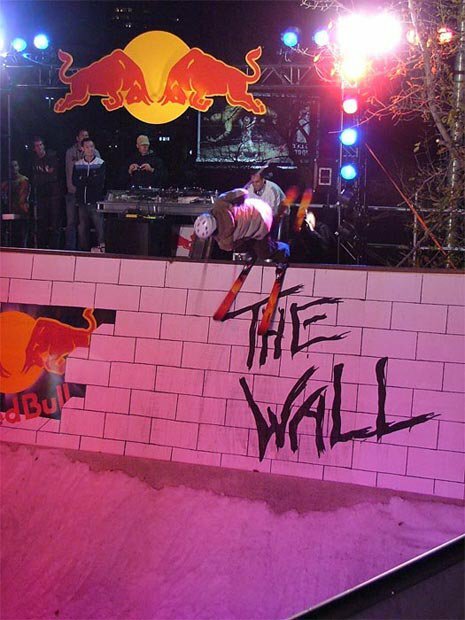 Mike Riddle took a similar approach to Matt Hayward, using the wall ride to throw cork 540’s and 720’s. Dumont kept his tricks simple but was by far the smoothest skier of the night. After finishing the 2nd qualifying round it was decided five skiers, one more than the original 4 would make the finals as it was too hard to call. TJ Schiller, Matt Hayward, Riley Leboe, Mike Riddle and Simon Dumont would compete in a game of PIG to decide the winner. Justin DoreyThe format for the finals definitely made it interesting, riders would need to be able to perform numerous tricks to win instead of just one. Matt Hayward, and Simon Dumont were the first out. After the first two riders were out it seemed like the comp would never end, Riddle, TJ, and Riley had no problem matching each other tricks. Eventually Mike Riddle dropped out and it was just down to TJ and Riley. It was decided one trick for the win, as everybody was getting anxious to start partying. Riley went first and fell while stalling on the wall. TJ followed up with a simple slide across the wall and took the win.